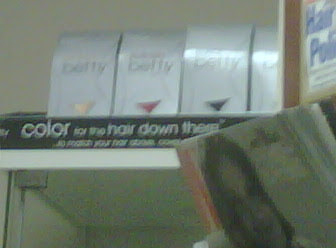 It reads, "Color for the hair down there." Really? People buy and use this stuff. Who are you people? No, wait. I don't want to know. What has me even more worried was when I went back today and they were almost out. Apparently people are still willing to buy..ah..."hair color" even when they can't afford to pay the mortgage. It's nice to know Seattle has their priorities straight. I think the bigger question is this: What kind of doctor's office sells hair dye? i'm not sure i ever really needed to know there was something like this on the market. ugh. What kind of doctor are you going to! !